"A spoon with large bowl and pointed stem"
This is the definition I used for an odd 'spoon' bought in the San Maurizio Market in Venice. 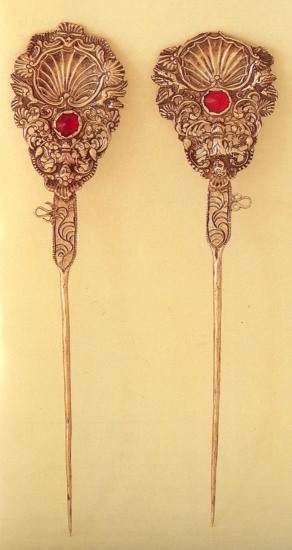 Little information was obtained from the seller: ... item made in the 18th/19th century ...French provenance. Several odd, uncommon and unusual objects are present in my collection, but this 'spoon' was for many years my preferred "question mark". 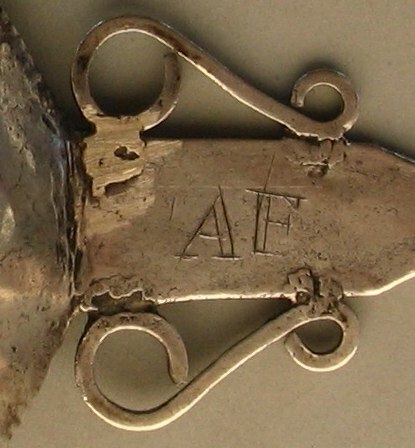 The 'spoon' was undoubtedly of French provenance and had the 'swan' used since 1893 to mark silver items of unknown origin sold in French public auctions. It is undoubtedly ancient (18th or 19th century), but its appearance doesn't correspond to any other spoon I had previously seen. The pointed stem resembled to 18th century 'tea mote spoon', but the bowl had no piercing. 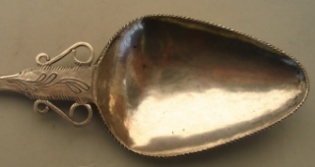 Mote spoons were used to skim floating tea leaves and tea dust (motes) off the surface of a cup of tea. 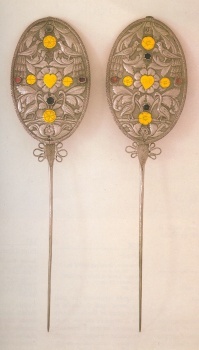 They were a late 17th century invention and used mostly as part of tea-services. This spoon continued to be a question for me. 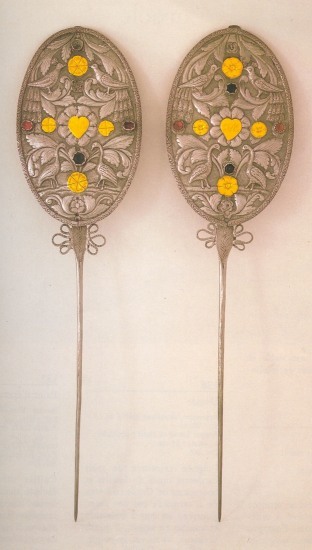 But, unexpected, the solution arrived some time ago: this object is not a spoon but a "TOPO", a long pin used by 'Cholas' women (original population of Bolivia) to shut down their shawls. long 31,2 cm; max large 5,7 cm. 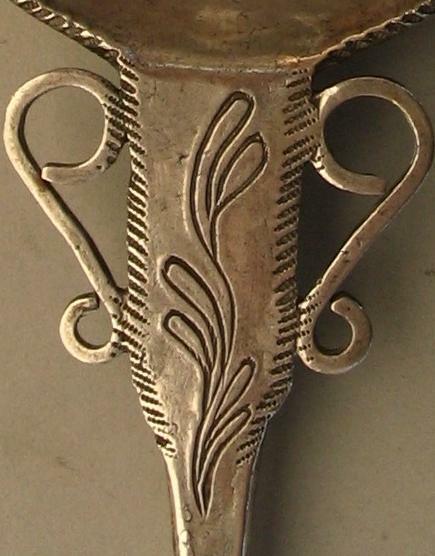 big shawl's pin with head in the shape of a spoon decorated with floral motifs engraved and chiselled. long 29,4 cm. ; max large 5,5 cm. 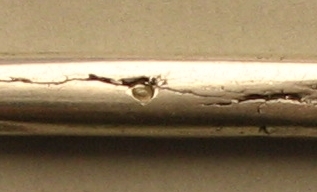 big shawl's pin with head in the shape of a spoon. 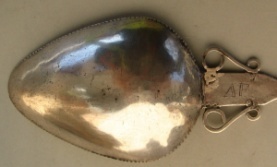 long 25,6 cm; large 6 cm. Almond shape head with irregular rim. A shell on the top, surrounded by smaller shells, birds and scrolls. 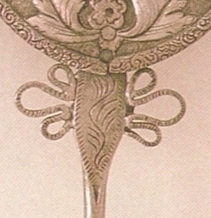 On the lower part, a human figure, upside down, on floral decoration. A red stone on the middle. long 49 cm. ; max large 12,7 cm. Monogram IM on the heart. Egg shaped heads. Flowers with gold heart on the middle. Symmetric vegetable decorations with two peacocks (on the top), flowers, and two long neck birds (lower side). White and red semi-precious stones. 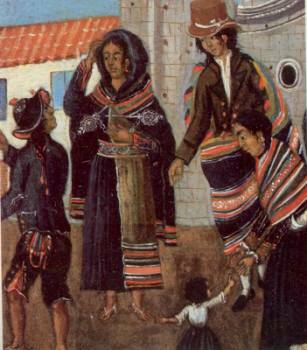 Potosi (now in Bolivia, once in Vice-Kingdom of Rio de La Plata). 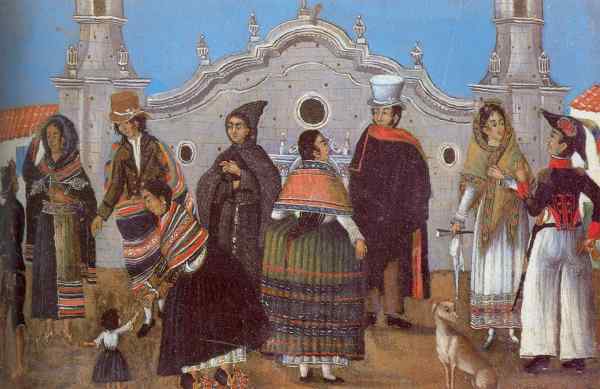 The discovery of ore in silver-rich Cerro Rico (rich hill) prompted the foundation of the city of Potos� in 1545. Large-scale excavation began in the site immediately and the city's population increased to nearly 200,000, making it one of the largest and wealthiest city in Latin America. During the early 19th-century, struggles for independence caused much destruction and the city's wealth was removed to Europe or to other parts of the Spanish realm. By then the population dropped to less than 10,000. By the time of independence in 1825, the mines of the Cerro Rico were almost exhausted and Potosi's economy has never recovered.